I happened upon her Red Pepper Soup and it was obviously a sign. A sign to make soup and stop buying ridiculous cartons of it (and no, I'm not hoarding three cartons of soup in my pantry at this very moment). Luckily, I had all the ingredients on hand and was amazed at how quickly the soup came together. In fact, most of the cooking time was down time where the soup basically cooked on its own and I cleaned the car seat of baby bodily fluid for what feels like the billionth time. And the soup? It was really good! The roasted red pepper flavor was spot on and the soup was creamy without using any cream. Overall, it felt way too delicious for a regular ol' Tuesday night. 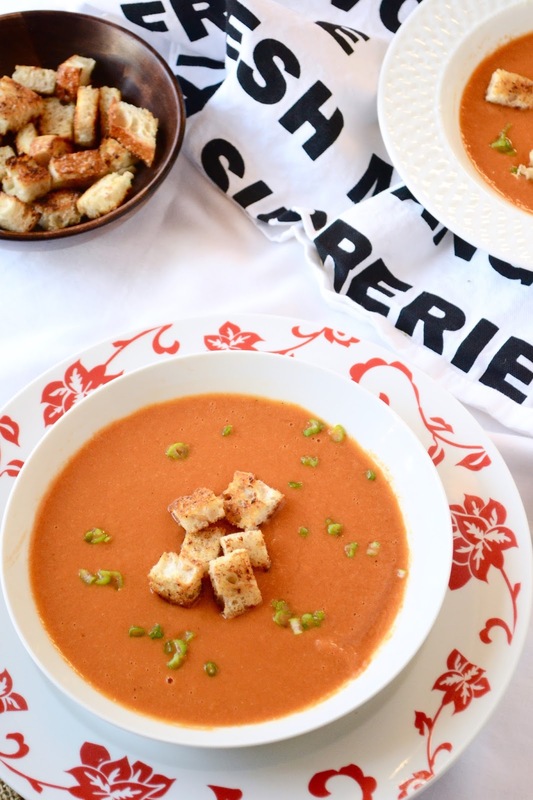 Oh, and I topped the soup with these homemade sourdough garlic croutons because we fancy! I mean seriously, how come no one ever told me you can toast some crusty bread in olive oil, sprinkle on a few spaces and come out with croutons that are way better than bagged croutons? So go and carpe diem because you can make your own soup and your own croutons and clean your own car seats. No wait, scratch that last part. Roast red peppers under broiler until skin is blackened. Remove peppers from oven and place in a paper bag. Fold down the top of the bag, and allow peppers to cool. When peppers are cool, peel the skin off and remove seeds. Cut peppers into strips. While peppers are roasting and cooling, heat one tablespoon oil in pot. Add onions and garlic, and saute until soft. Don't let the onions become too brown (or burn) because you'll have to start over. Not that I'm speaking from experience or anything. Add the remaining ingredients and simmer for 15 minutes. Blend soup with hand blender. Serve with fancy croutons or potato chips, depending on your mood. Yumm!! That soup is gorgeous. What beautiful color. 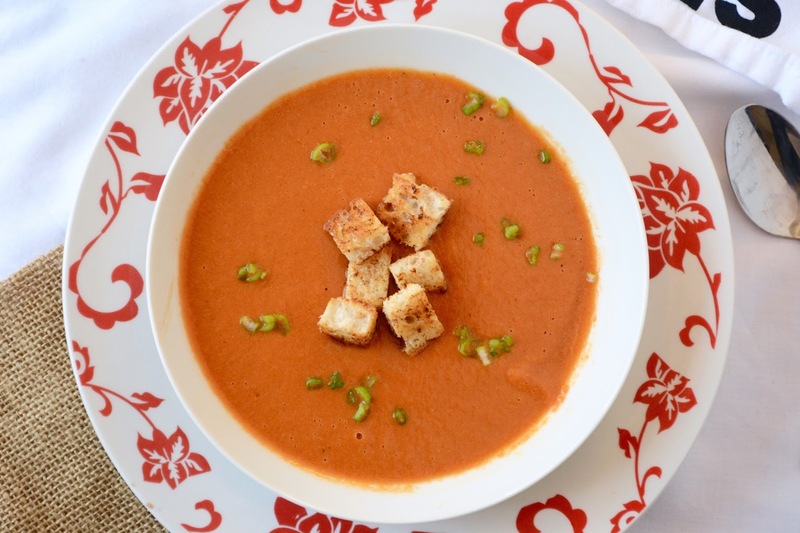 Red peppers being so delightfully sweet would make this soup tasty! Beautiful presentation! This looks and sounds absolutely fabulous! I remember those days. Sophie has a stuffed bear that she calls throw-up bear because she did just that while holding it and sitting in her car seat. To make matters worse, we were on our way to Chicago when it happened. Not a good time. Anyhooo, the soup looks amazing and sounds delicious. Great soup choice and as always I am leaving your blog with a smile on my face. This is one heavenly looking soup! Nice choice my friend. Hope to see you soon! Wonderful post as always! And beautiful pictures.